I'd like to think that I am the world's expert on seriousness. Ever since I noticed my serious attitude as 10-year old boy I've been seriously serious. As you'll see in the video below, it's good to take some parts of life seriously - the work parts of life. Doing so (hopefully) means that life is more fun. But it ain't good to take yourself seriously, it really ain't. Seriousness represents a lack of ease with self, a lack of ease with life. And nothing is easy when you're ill at ease. And I should know, remember, because I AM a world expert on seriousness. Or at least I was... once! I loved compiling and creating this latest page on the site. 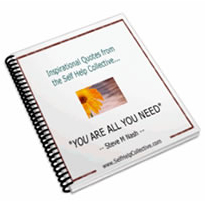 It features my top 10 greatest inspirational quotes - with reasons why! Yep, creating the three pages of greatest quotes WAS a lot of fun - hope you enjoy them! PS Now please comment, please share your views about the power of giving - thank you!